Hey everyone. I'm currently in the Arctic at the moment, specifically in Inuvik, NW, Canada. 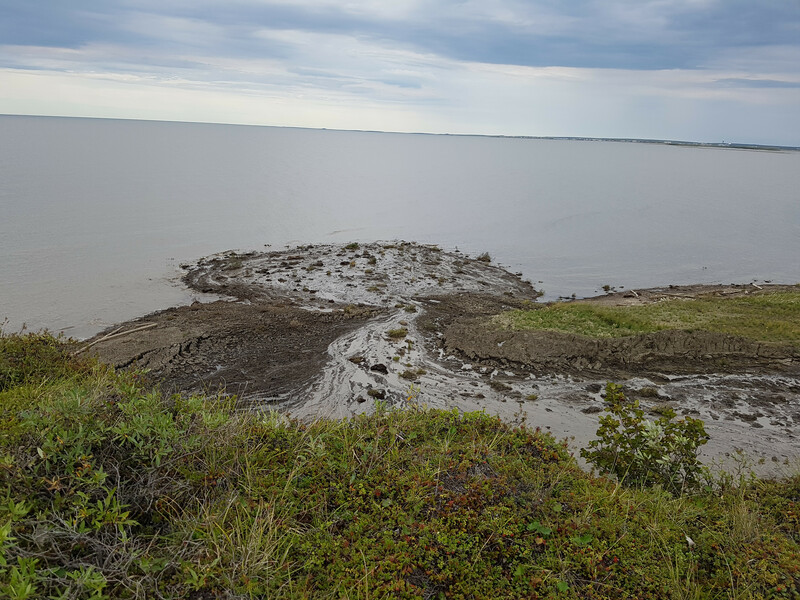 This afternoon I'll be leaving for Tuktoyaktuk and will spend the following 2 weeks studying coastal erosion processes at numerous sites all along the Tuktoyaktuk peninsula and out along the Mackenzie delta. Unfortunately, a combination of haze and forest fire smoke made getting good photos from the flight in next to impossible. The air toward Yellowknife was better though. I'll be in Tuk with a big team of other researchers, mostly Canadian, but others from all over too. Even the people you meet around are fascinating. For example, the two others sharing the house last night with myself and my supervisor - one is a cultural anthropologist that plans on living with some of the small local communities here and the other is studying methane release from lakes. Never a shortage of really cool people with fascinating projects going on, which I'll definitely discuss more over the coming weeks. Anyway, busy day ahead loading and prepping for flights and boat trips, so I gotta go now. But I'll keep the updates coming - internet connection dependent of course. Interesting news BFTV! I take it you guys are aware that some big waves are on the way to your vicinity? 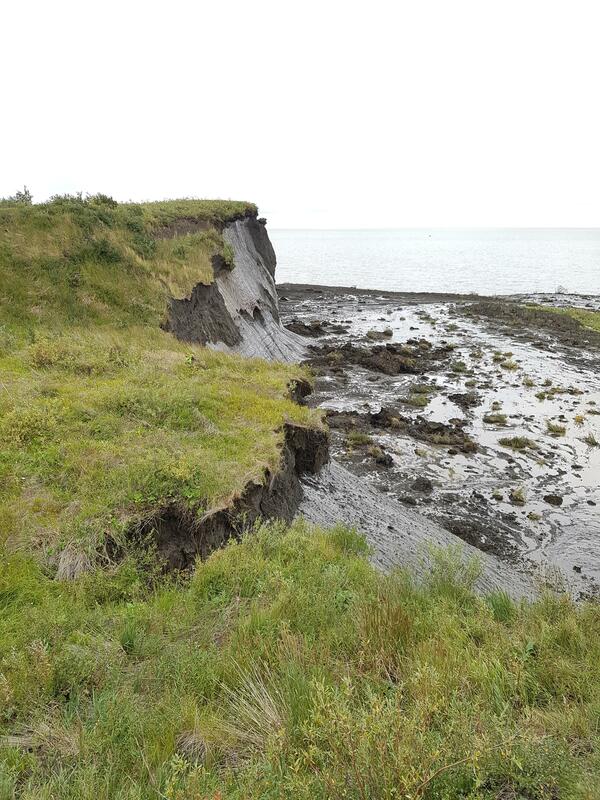 Please let me know if you notice any Arctic coastal change as a result, though it looks like Utqiaġvik and thereabouts will have (had) the worst of it! BFTV, that sounds amazing. Thank you for doing this. I wish you the best. What a marvelous adventure. Please fill us in whenever the gods of the internet allow. I'm thrilled at having another contributing from the very jaws of the beast! BFTV, if you feel like using the ASIB to share some of your experiences or write about coastal changes, you know where to find me. Good luck, have fun and learn as much as you can. Have fun up there BFTV! Cheers guys. I'll try keep the updates ticking along. 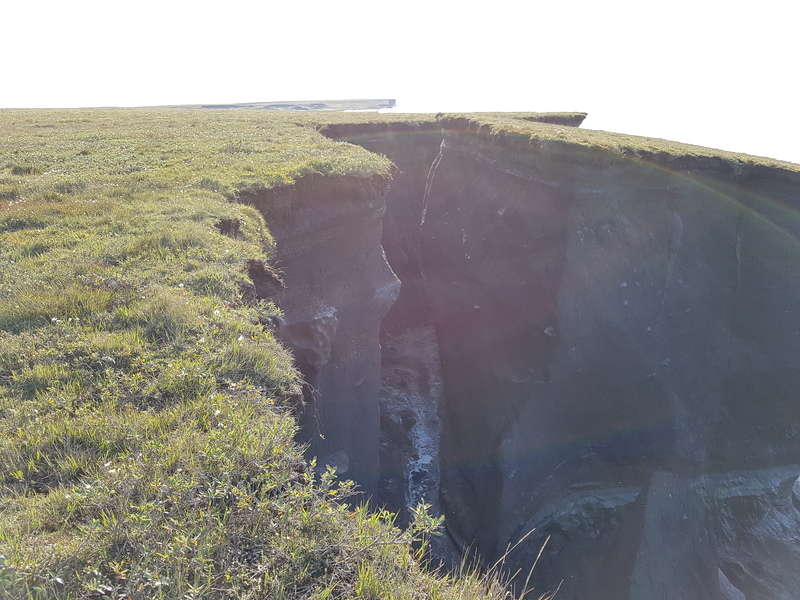 Neven, I will try put together a proper update for the blog, life out in Tuktoyaktuk as a researcher, maybe some profiles on the other researchers we're with and the work we are all doing. 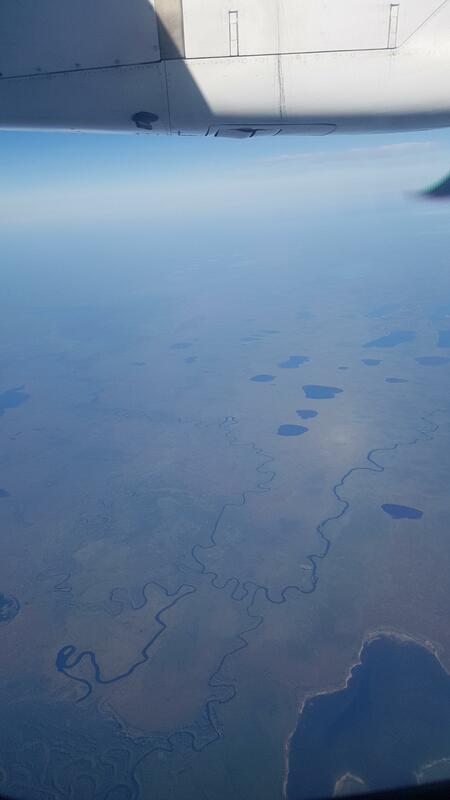 Here's a quick pic of the thermokarst lakes out by Tuk on the flight over today. Thermokarst is a land surface characterised by very irregular surfaces of marshy hollows and small hummocks formed as ice-rich permafrost thaws, that occurs in Arctic areas, and on a smaller scale in mountainous areas such as the Himalayas and the Swiss Alps. These pitted surfaces resemble those formed by solution in some karst areas of limestone, which is how they came to have karst attached to their name without the presence of any limestone. Small domes that form on the surface due to frost heaving with the onset of winter are only temporary features. They then collapse with the arrival of next summer's thaw and leave a small surface depression. Some ice lenses grow and form larger surface hummocks, which last many years and sometimes become covered with grasses and sedges, until they begin to thaw. These domed surfaces eventually collapse either annually or after longer periods and form depressions which contribute to uneven surfaces. These are included within the general label of thermokarst. This was a new term for me. Thanks for the updates from your adventure BFTV. Hey all. Just a few pics for an update, rather short of time. This is an area called Peninsula point, to the west of Tuk. Incredible slump features with loads of exposed ice cliffs. You can literally just sit there and watch the landscape change around you. You have variable ice thickness with silt and clay sat atop it. 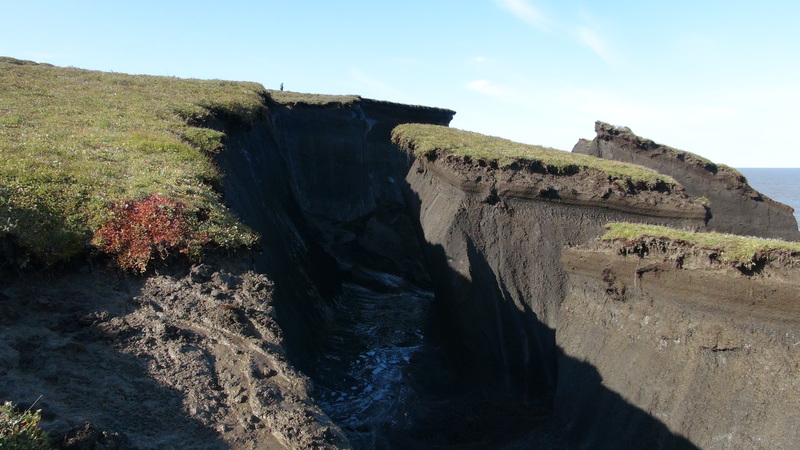 As the ice melts, the soil slumps onto the ice, slides down into the saturated area forming a large muddy flow that extends into the ocean forming the fan shape seen in the photo below. That's a 65L grey and lime green bag in the centre left, for a sense of scale! Here's an area we'll be visiting on the 23rd (I think). 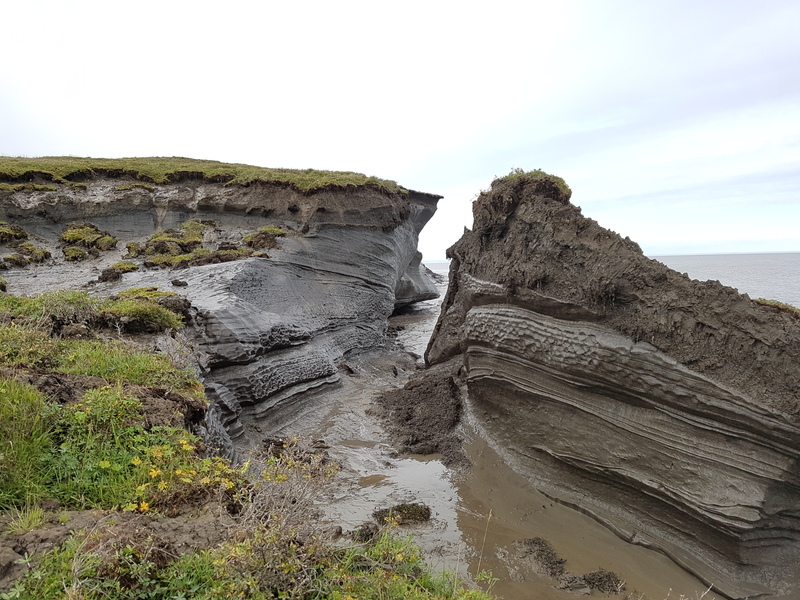 These are permafrost blocks, where waves undercut the cliffs, extending inland until the coast collapses as a solid block. And yes, that is a person standing in the background! More stuff to come soon, including helicopter footage and short timelapse footage of actively eroding cliffs. We're also doing an AMA later tomrrow/early morning of the 21st on reddit.com/r/science. So keep an eye out! Thanks for including us in your adventures BFTV. Looking forward to your next instalment! Here's the AMA (Q&A) type thing we're doing on reddit today. We won't be answering questions for another 10 hours though, so not the best timing for the Europeans! Curious if you ever find any archeological artifacts in those types of features. Hey all. More updates to come in the blog soon. However, as I'm now back in the UK, I thought I'd mention that we went to an incredible site on the 2nd last day with collapsed blocks of permafrost about 50 or 60ft tall. 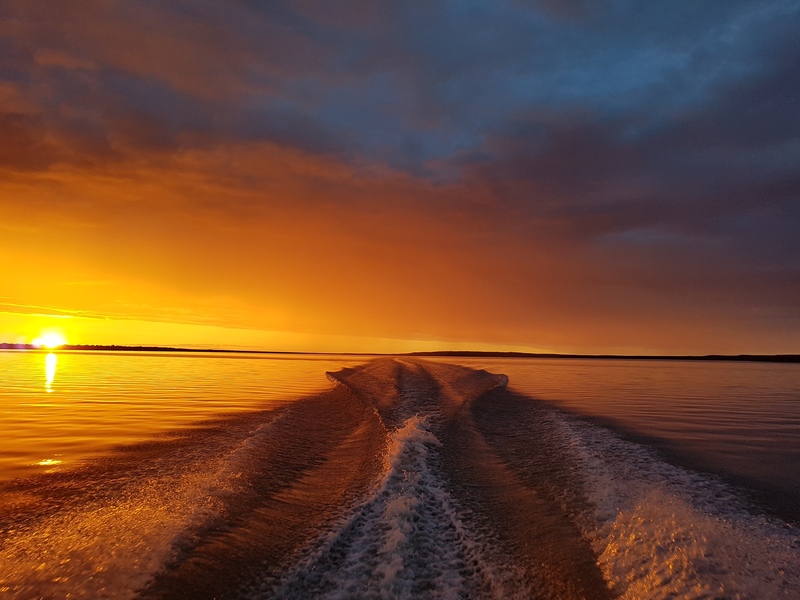 On top of that, that we had an incredible 4.5 hour boat ride from Tuktoyaktuk to Inuvik through the Mackenzie delta during sunset on the way home. Amazing views, and here is one of them. I see three distinct layers from the top, followed by a long flat layer that seems to extend all the way down. Does anyone know what time frames those layer represent? Hundreds of years perhaps thousands? Do they have a name? It there some event that can be tied to the layer's boundaries? I can tell you it was mainly a silty clay, but very ice rich, so much so that the thermal imagining of the layers came up and almost entirely 0C. The whole island had incredible features though. We only had half a day out there, so I was limited in what I could do. Here's an image from the opposite (western) edge of the island. The left is a slump feature, and all that exposed grey material is ice, and on the right are more large blocks. Such an incredibly complex and rapidly changing landscape. Our Canadian collaborators had set up time 3 or 4 timelapse cameras in what they thought were safe areas just 2 weeks before these images were taken. That slump feature wasn't there at the time. They lost every camera.